Steve Reoch at All Ocean Yachts sends in news of a €350,000 price drop on his central listing for sale, the 25.9m motor yacht Blue Lady. 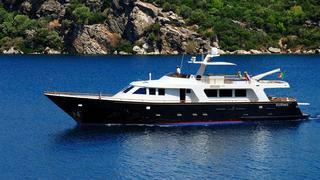 Built in 1992 by the Rossato yard in Venice, Italy, Blue Lady is a full-displacement yacht with a bulbous hull. An interior in hand-rubbed mahogany includes a main saloon with comfortable seating on a settee and two lounge chairs and an entertainment centre including a 50-inch Sony Bravia LCD television screen. Accommodation is for nine guests in four staterooms and four crew in two cabins. The master suite is full beam with wardrobes and en suite shower while the VIP stateroom is aft and separate from the rest of the yacht with its own entrance. A further double has a queen size bed and an en suite fitted in marble. The twin cabin is en suite and has a Pullman berth. Both the bridge and main decks have full walk around side decks with the teak renewed in 2010. On the flybridge, the helm station has a double settee and seating for al fresco dining plus sunpads. Twin 240hp Caterpillar engines give Blue Lady a cruising speed of 10 knots and an respectable range of 3,500 nautical miles. Lying in Rome, Italy, Blue Lady is down from €1,300,000 to €950,000.